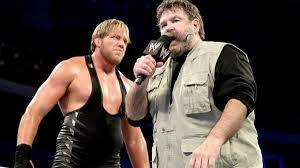 WWE announced Monday that Jack Swagger has been granted his release. The real-life Jake Hager had apparently been looking to get out for awhile, even bringing it up on Chael Sonnen’s podcast earlier this month. Hager was signed to a WWE development deal in 2006. So he spent about a decade with WWE. He had a run that a lot of guys would be jealous of. The company clearly saw a lot of potential in him, perhaps as someone in the Kurt Angle mold. They did their best over the years to establish him as a top guy. Had the dice fallen differently, it might have worked. But fate just didn’t seem to be on Hager’s side in that respect. Hager is a very good wrestler. But when it was time to talk, he was in trouble. He has a little bit of a lisp, and it was noticeable whenever he got on the mic. It undercut the wrestling stud vibe they were going for with him, and it became tough to take him seriously. They had him win Money in the Bank, and later made him World Heavyweight Champion on Smackdown. But it just didn’t click. And then he got arrested for DUI and drug possession (marijuana). He and Mantel remained together, but it was essentially over as far as Hager being a top guy. But Hager’s career doesn’t have to end here. Like Drew Galloway, Cody Rhodes, and so many others who’ve left the WWE umbrella, he can thrive on the independent scene. I also wouldn’t be a bit surprised to see him show up in TNA in a few months, as his old pal Dutch is now back on the creative team there. Brighter days are ahead for Jake Hager, and I commend him for having the guts to step outside the safety of the WWE bubble. Paul Heyman and Brock Lesnar address Bill Goldberg. Herman’s prediction: “Down goes Goldberg!” That “down goes Goldberg” line is something they’ll be returning to in the weeks to come. It’s something Corey Graves, as the heel announcer, can come back to at the event itself. It’s a great line. Sasha Banks def. Dana Brooke. 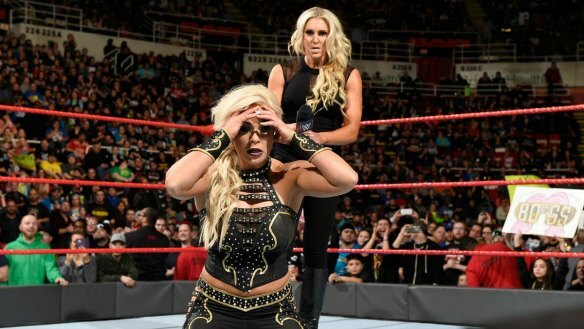 After taking abuse from Charlotte post-match, Dana attacks her. Dana has gotten a lot of bad press these past few weeks for her in-ring skills. Looking at this match, I can’t say it’s unfounded. But the real-life Ashley Sebera has only been wrestling since 2014. She’s still trying to learn. But she’s doing it on national television. It takes a lot of guts to put yourself out there like that. Having said that, she could really use another run on NXT. She can re-establish herself there, and come back later for a fresh start. Perhaps that’s where this turn is headed. I doubt it, but one can always hope. Brian Kendrick and Tony Nese def. Akira Tozawa and TJ Perkins. TJ Perkins had a good match with Shinsuke Nakamura on NXT last week, and he was tremendous in this match. But this guy needs a heel turn. He’s looked like a loser for months, and he’s officially grating. I wouldn’t mind seeing he and Tozawa in a program. 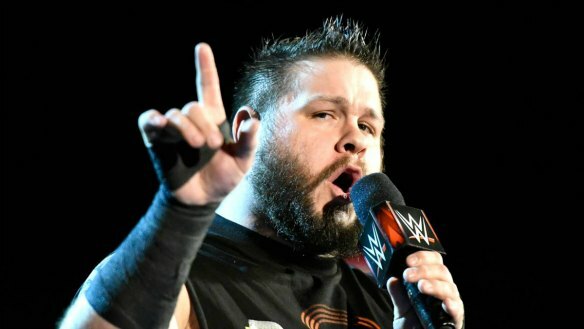 Kevin Owens vows to take Chris Jericho’s US Title at Wrestlemania, and leave nothing left but the “Tears of Jericho.” Owens and Samoa Joe get themselves disqualified in a match with Jericho and Sami Zayn. Another really good promo from Owens. In classic heel fashion he justified his actions, believing himself to be right. He accused Jericho of wanting to get close to him just to get close to the Universal Championship. I love when bad guys do that. No one really believes they’re evil. We all usually believe we’re doing what’s right. This Owens/Joe team-up did nothing to dispel the rumors of them forming a faction alongside Triple H. I’m not sure you need Triple H on TV every week in a group. But the prospect of Owens and Joe together consistently remains ntriguing. I wouldn’t have had Owens and Jericho touch here. At the very least, I’d have limited their contact to that super kick Owens gave him. But then again, Owens obviously beat the hell out of him at the now infamous Festival of Friendship. So I guess we’ve been there and done that. But what I got out of this segment was the line about Show getting the opportunity to be a two-time winner of the Andre the Giant Memorial Battle Royal. Ouch. I guess that makes it official: Shaq is out of Wrestlemania. That’s a rotten break for Show. 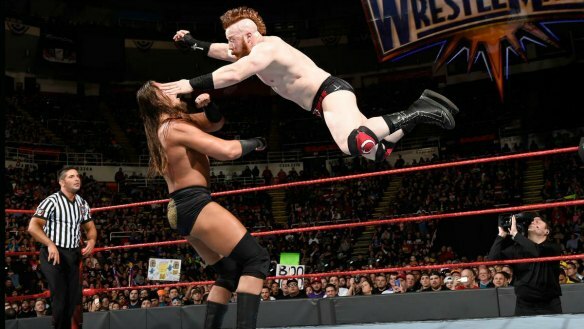 He supposedly spent months preparing for that match, getting himself in the best shape of his career, only to be stuck in the Battle Royal again this year. Cass had some really nice fire in that pre-match promo. He still had some that deer-in-the-headlights look going on. But he made me believe. Sheamus and Cesaro vs. Enzo and Cass goes to a no-contest after Luke Gallows and Karl Anderson interfere. Not much suspense to this match. Earlier in the show, Anderson and Gallows cut that promo about taking the spotlight for themselves. The finish to this one was pretty obvious at that point. As if it wasn’t already pretty clear what the match is going to be at Wrestlemania. And of course a short time later it was made official: a Triple-Threat Tag Team Match for the Raw Tag Team Titles. If this does turn out to be Undertaker’s retirement match, how fitting is it that it’s Shawn Michaels who planted that seed in Roman’s mind. Nice continuity there. Austin Aries def. Ariya Daivari. Austin Aries wrestling on Raw. By God, what a time to be alive. Bayley def. Nia Jax via DQ. Couldn’t muster up much enthusiasm for this one. We’ve seen this one so much. I dig the larger story they’re telling here, though. The idea is that Bayley can’t win big matches without Sasha’s help, so all these women are worthy of title shots. I expect Nia to be added to Wrestlemania in short order. Mick Foley refuses to fire someone by order of Stephanie McMahon. Triple H comes out to belittle him. Seth Rollins makes the save, but the Game destroys the would-be “King Slayer.” I loved this segment. I really did. Everybody was perfectly in character, and it made perfect sense. This was great drama. Seeing Mick and Triple H in the ring together was a nice nostalgia trip. They’ve always had a great lovable hero meets cunning villain chemistry. Foley was good on the mic here, too. He stumbled a bit, but he was in the zone. He hasn’t had an easy time in this role. But I was proud of him tonight. Didn’t expect Rollins to be on the losing end of that confrontation with Hunter. But it makes sense when you stop to think about it. Seth’s knee has a big question mark over it. So now we’re left guessing. Those CM Punk chants aren’t going away, are they? They’re following Steph, in particular. Considering the adverse effect that character has had on this show in recent years, I’m not complaining. I’m a Punk fan, after all. This entry was posted in Wrestling and tagged Akira Tozawa, Andre the Giant Memorial Battle Royal, Ariya Daivari, Austin Aries, Bayley, Big Cass, Bill Goldberg, Bill Goldberg Wrestlemania, Brian Kendrick, Brock Lesnar, Brock Lesnar vs. Bill Goldberg, Cesaro, Charlotte Flair, Chris Jericho, CM Punk, Dana Brooke, Dutch Mantel, Enzo & Cass, Jack Swagger, Karl Anderson, Kevin Owens, Luke Gallows, Mick Foley, Nia Jax, Paul Heyman, pro wrestling, professional wrestling, Roman Reigns, Roman Reigns vs. The Undertaker, Sami Zayn, Samoa Joe, Sasha Banks, Seth Rollins, Shaquille O'Neal, Shawn Michaels, Sheamus, Stephanie McMahon, The Big Show, The Undertaker, TJ Perkins, Tony Nese, Triple H, WWE, WWE Raw, WWE Raw results on 03/13/2017 by primaryignition.